(Newser) – Many of us have been annoyed by kids kicking the back of our seats during a movie—but not many have ended up pulling out guns because of it, like an irate moviegoer in Kentucky did. 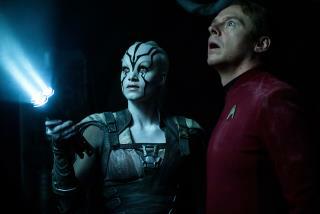 Police say that at a Saturday screening of Star Trek Beyond in Paducah, a man got up and swore at the boy behind him, asking him if he was going to keep kicking his seat. "The boy's father interceded and a fight broke out between the two men, police said in a Facebook post, per the Hollywood Reporter. "As the father got the upper hand in the fight, witnesses said, the other man pulled a gun and said, 'What the [expletive] are you going to do now?" He's going to go where many men have gone before, to prison.